19 Then, the same day at evening, being the first day of the week, when the doors were shut where the disciples were assembled, for fear of the Jews, Jesus came and stood in the midst, and said to them, "Peace be with you." 20 When He had said this, He showed them His hands and His side. Then the disciples were glad when they saw the Lord. 21 So Jesus said to them again, "Peace to you! As the Father has sent Me, I also send you." 22 And when He had said this, He breathed on them, and said to them, "Receive the Holy Spirit. 23 If you forgive the sins of any, they are forgiven them; if you retain the sins of any, they are retained." 24 Now Thomas, called the Twin, one of the twelve, was not with them when Jesus came. 25 The other disciples therefore said to him, "We have seen the Lord." So he said to them, "Unless I see in His hands the print of the nails, and put my finger into the print of the nails, and put my hand into His side, I will not believe." Let us briefly examine the highlights. The first thing Jesus did when he appeared to the disciples was that He gave them Peace. Then he gave it again. In our Holy Qurbana, the priest offers peace to us from the divine alter - from God - 4 times. 1. At the beginning of the Anaphora before the Holy Mysteries, the peace is offered from the Holy alter. Then the presiding priest gives the hand of peace to the Deacon who passes it to others in Madbaha and then to everyone in the church saying, "The peace of our Lord and God." The recipient says, "May it be with us and among us." 4. The peace is offered again at the thanksgiving service after the second coming and prior to dismissal. Romans 5:1 tells us that "therefore being justified by faith, we have peace with God through our Lord Jesus Christ." After Jesus gave the disciples (and us) Peace, he gave them Power. John 20:22 tells us that "when he said this he breathed on them." Our Lord's breathing upon the disciples is reminiscent of Genesis 2:7 when God breathed into Adam to transform him. This action of Jesus toward the disciples gave them the spiritual power and discernment they would need to fulfill His commission. The Christ breathing on the disciples transformed them. Christ gave them power through his breath and they were transformed. This was the initiation of the 'Great Commission', God's plan to proclaim the Good News to every person on the earth. So, a lot was accomplished on this visit by Jesus that has great implication to the future church. Now we come to the other important part of this passage. As noted, Thomas, was not there with the disciples when Jesus visited them the first time. When Thomas returned, the other disciples told him about the physical appearance of Jesus Christ. Thomas refused to believe them insisting that he wants physical proof. He said, "unless I see in His hands the print of the nails, and put my finger into the print of the nails, and put my hand into His side, I will not believe." This has earned him the dubious title, "Doubting Thomas"- the man who doubted the resurrection of Jesus Christ. And the term "doubting Thomas" has negative connotations to this day. This is really an unfortunate and unjustified representation of St. Thomas, who was an outstanding apostle. He was a person who talked the way he saw things. Many people sit in a meeting; but won't raise a question being afraid that they may ask an inappropriate question. Thomas, on the other hand, was a straightforward person. He called as he saw it. Thomas was looking for tangible, touchable proof of Jesus' resurrection. He had such proof of Jesus' death. He was there. He saw it. He wanted a similar proof of the claim that Jesus, whom he had seen die, had been seen alive by the other disciples. In fact, in moderation, doubt is healthy. It gives us an opportunity to meditate and pray so what is presented to us so that Holy Spirit can help us resolve the situation. Yes, faith is something we believe without proof. Faith and belief goes hand in hand. As Craig Blomberg stated: "You could say ... belief builds on the direction the evidence is already pointing." 3 You can prove things to a point, but beyond that point comes belief. Then comes trust in the one to whom the evidence is pointing. That was certainly true for Thomas. When Jesus appeared after 8 days, he was satisfied. He didn't have to touch him to believe. Thomas went one step further. With the evidence literally at hand, he did not simply say, "He is risen indeed!" but rather, he said, "My Lord and my God!" (John 20:28). It was a very powerful statement. It was a statement of belief far beyond simply not doubting what the other disciples had said. "My Lord and my God" is a faith statement of the first order. A belief statement far beyond bickering over biblical facts. The articles by John Jewell and The Rev. Dr. Janet H. Hunt in this issue of Malankara World Journal give further insight into apostle Thomas. We will see what a remarkable person St. Thomas really was. He travelled all the way to India to tell us about the Resurrected Savior, he had first hand experience with, and was martyred in the process. 1. Newsweek, April 8, 1996. 2. "Missouri, 'My Fair Lady,' and the Mission of the Church," by the Very Rev. Chadwick Vaughn, Day 1, 2012. 3. Time, April 8, 1996, p. 59. 4. The Zondervan Parallel New Testament in Greek and English (Grand Rapids, Michigan: Zondervan Bible Publishers, 1980), p. 339. 5. The Last Beatitude -- Sermon on John 20:19-31 by Richard L. Sheffield. When a child is conceived in the mother's womb, one cell is knitted to another. The parents' genes combine in a way that can never be separated, and they create an entirely new DNA - a new being is created that is special and unique. This is an appropriate image for today, a day set aside to celebrate God's divine mercy. In modern usage, the word "mercy" is usually identified with compassion and forgiveness. When we offend someone or make a mistake, we hope that the other person will forgive us - will have mercy on us. But divine mercy goes much deeper than a pardon for our sins. In fact, the Hebrew word for "mercy," rahamin, speaks of the intimate attachment between two people. And so as we honor God's mercy today, we celebrate not only our forgiveness but the bond that our Father has with us. We celebrate the fact that we are so important to God that he wants to be knitted to us in an intimate, unbreakable bond. Today, imagine God saying, "I've forgiven you, my child. Now won't you come back to me? You are flesh of my flesh, bone of my bone. You belong to me, and I belong to you. So let's make our relationship right. Let's make our relationship go deeper than before. Let me shower you with my mercy, even as you offer me your praise and your love." So come to Jesus and welcome his mercy. Rest in his presence and let him rest in your presence. Commit yourself to him and let him bind himself to you. Imagine him weaving his heart with yours. Listen to your own heart beating and know that his heart is there as well. Believe, even if you don't see the evidence right now, that he is filling you with his Spirit. Believe that he has hope, joy, and peace waiting for you. Hear him telling you that even if a mother could possibly forget her nursing child, he will never forget you (Isaiah 49:15). "Jesus, I trust in you. Knit yourself into my being." Finally, the foster mother said, "Are you frightened, Virginia?" "Kinda," she replied without looking up. Then, "I've been in lots of homes." "Well," the sympathetic woman tried to reassure the bewildered young mother-to-be, "Let's hope this time turns out for the best." Virginia's reply is one of those statements that sticks to your soul -- it was flat, without change of tone and without Virginia even looking up -- "Hurts too much to hope." Thomas was not present when his friends, the other disciples saw Jesus -- Not an illusion, nor a phantom, but Jesus! Jesus with the wounds in his hands and side. The rather stiff phrase in our scripture reading, "...the disciples rejoiced when they saw the Lord," hardly communicates the depth of what it must have meant to see it all fulfilled. "I will see you again," Jesus had promised. And after the ugly scene on Friday here he was! But Thomas was not present to experience the joy. All of us must deal with grief in our own particular way -- and that includes Thomas. He needed time to deal with his grief before he could join the others. The depth of his hurt was too deep. And this is exactly where our lives intersect the road Thomas had to travel. How do you pick up the pieces and go on when you lose someone who has become a basic assumption of your living? "Dad will always be there to lean on -- Won't he?" -- "I can always ask mom -- Can't I?" Then it hits. "No..." There are times when life hits you with such powerful disruption you wonder how you can ever pick up the pieces and go on! Times when it hurts too much to hope that things could be better. Thomas, the proverbial "seeing is believing" type fellow, had discovered something wonderful in Jesus Christ that had turned his life around. There is something wonderful about the story of Thomas. If Thomas could find a way out of his grief and hopelessness and go on, then I can too. Whatever led him out of the dark place of doubt and discouragement can become a guiding light for you and me. In the first incident, Lazarus has died and Jesus says to his disciples, "Lazarus has fallen asleep," and then states, "I am going to wake Lazarus up," The disciples don't get it. Lazarus will be okay if he's sleeping they say. "No... Lazarus is dead," Jesus explains. Then comes this incredibly revealing comment from Thomas, "Let us also go," he says to his colleagues, "that we may die with him." In other words, if Jesus is going to go and join Lazarus in death, then Thomas is ready to go with him. While our knowledge of Thomas is limited, we do know this one thing. Thomas had so invested his life in Jesus that he was willing to follow him into death if that's what it took to be near him! Jesus had become the hub around which Thomas' life revolved. Whether he was a "Virginia" who had never found a home or a wanderer who had never found an aim... he loved Jesus. The second incident takes place during the Upper Room Discourse when Jesus is attempting to pull things together for his followers in this last evening they will share together. If the disciples are beginning to finally understand that Jesus is going to die, they are not able to figure how they will go on. Jesus tries to reassure them -- remember the words? John 14:1-4 "Do not let your hearts be troubled. Believe in God, believe also in me. In my Father's house there are many dwelling places. If it were not so, would I have told you that I go to prepare a place for you? And if I go and prepare a place for you, I will come again and will take you to myself, so that where I am, there you may be also. And you know the way to the place where I am going." Thomas asks the question most of them might have had in their minds but didn't express, "Well now -- actually Lord, we don't know where you're going. How can we know the way?" Here is the second of two strong clues into Thomas' life that can help us understand the meaning of this morning's gospel lesson. Thomas is one of those "what you see is what you get" kind of guys. He isn't about to sit and pretend he understands when he doesn't. He is the kid you always wanted in your classroom who would risk asking all the things you wanted to ask, but you hesitated because you didn't want to appear to be ignorant -- or at least you wanted to go along with the assumption that you knew these things. A drama of transformation occurs in our scripture and in the life of Thomas as he moves from grief and despair to hope and joy. There are four important lessons which translate directly into our lives and into principles the church / family of faith needs to embrace. The disciples gathered, in part, to deal with their grief and experience of loss. Thomas, for whatever reason, could not work through his grief with the group. He had to have the freedom to be apart before he could be with them. That's important for you and me as individuals. We need to give ourselves permission to "do it our way" and not be pushed into "but, everybody does it this way." One of the difficulties with the popularity of concepts like Elizabeth Kubler-Ross' Stages of Grief is that some people begin to expect others to move in order from stage one to stage five. "Yup... Thomas' is definitely in denial right now ... we should expect his anger quite soon!" As we need to give ourselves permission to deal with grief and pain in our own way, so also the family of faith needs to allow for differences in dealing with life's tough times. We're not sure how it happened, but it is likely that one or another of the disciples said, "Hey, we've got to tell Thomas." In any case, they reached out to Thomas and Thomas was open to their contact. Even in the midst of pain and doubt, an open door to the friendship of others is the first step on the journey to recovery. In a great example of true fellowship, Thomas is able to express -- and his friends are able to accept, honest emotion and authentic expression of doubt. It is absolutely crucial for our growth in faith to have freedom to express honest feeling and honest doubt. A basic principle here is: "We can not work through and bring faith to, any issue we can not share with our family of faith." Acceptance like this has not been the strong suit of many churches, but it must become so! If you spend enough time with people over a long period of time -- in all kinds of difficulty, you will discover an important and powerful principle: "We hide from each other the things we have most in common! Think about it. You are having difficulty in your marriage, but feel a sense of failure, so you hide the pain instead of reaching out for help. A young person is filled with a sense of being unacceptable, but instead of reaching out to a parent will reach out for an anesthetic (drug). You find yourself struggling at work, but feel that asking for help will show inadequacy. Perhaps most difficult for we pastors to hear is something like the remark of a young man who had been absent from church for some time. By coincidence, he happened to see his pastor at a department store one day and said, "I don't feel like I can come back to church until I get my act together!" 4. Jesus accepts us where we are and gives us strength to get where we need to be! This is the key point of today's scripture. 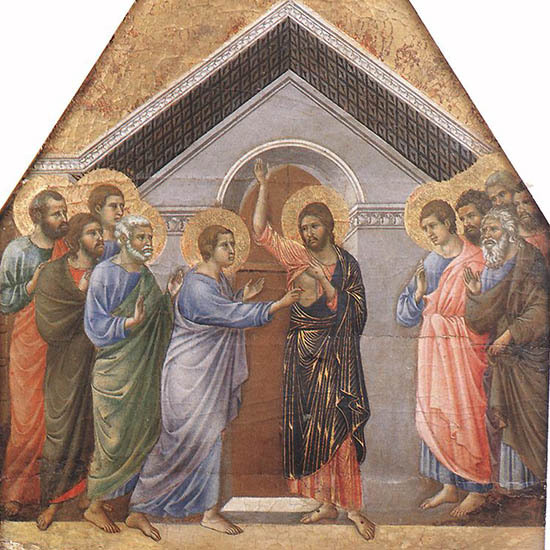 When Jesus finally appears for Thomas, (most likely when Thomas was ready to receive it) he doesn't scold, "Thomas you bonehead! How could you not believe in the resurrection? " Jesus knows Thomas for who he truly is and gives Thomas what he truly needs. The result? Thomas finally sees Jesus for who he is -- Lord and Savior. But it could never have happened if Jesus had not met Thomas where he was. This gave Thomas strength to risk hope once again. Have you ever had a time like Thomas? A time when disappointment was so intense you found it hard to hope? Or maybe you know someone who is struggling even now. Whether it be for you or for someone you are close to... how would you rate the four principles in this message as they apply to you or to your friend? The key to hope is realizing that no matter how difficult the way we must tread... Christ comes to us where we are. May God give us the grace to be the kind of persons and the kind of fellowship where lives are transformed, and where broken spirits find the strength to hope again! I can still remember the sinking feeling in the pit of my stomach when the trailer lurched forward and caught my dad's hand between it and the hitch on the back of the family station wagon. I was twelve, maybe thirteen years old. That would have made my sisters eleven, ten and nine years old. I was still bigger than they were and stronger. Mary, Sarah, and I had been assigned to the back of the camper to push and Martha was standing next to my dad waiting to guide the camper into place. Only the wheels were caught on some kind of grade and try as we might we couldn't seem to get it to budge. My dad shouted at us to push just one more time and I gave it all I had and felt it give. Before we could fully understand what had happened, my mom was driving him to the local emergency room with a towel wrapped around his bleeding hand. We were left to sit and wait around a now cold campfire --- I remember carrying the guilt heavy in those waiting hours for I knew it was my effort that had hurt him. A few hours later they were back. His wounded hand now sported a couple of stitches and a big white bandage. He was quick to assure us that it was his fault, not ours, for we were only doing as we were told. And then he went on to say that he was glad it was his hand that took the blow and not Martha's… for he knew the damage to her much smaller hand would have been far worse. Like any loving parent, he would willingly take the pain in place of his child any time and every time if he possibly could. He bore the scars of that particular afternoon on his hand the rest of his life. I sometimes think the mark on the palm of his hand said as much about who he was as anything did. Indeed, I suppose it is so for all of us. Our scars tell part of the story of who we are, what has mattered to us, what has happened to us, the risks we've taken, the gifts we've given. And as we are reminded in the story before us in John's Gospel, this was surely also so with Jesus, too. Which is why Thomas insisted he needed to see, no more than that, feel the scars in his hands and put his own hand in Jesus' side to be sure that it was him. One would think he would have recognized him with from the features of his face or the sound of his voice, but no, for Thomas, Jesus had become something more since that long walk to the cross a week before. Jesus' very identity was now defined by the sacrifice he had made in our behalf. A sacrifice made most visible in those wounds that by then could have only begun to heal. Now it seems to me in recent years that Thomas' reputation has been somewhat redeemed. I'm old enough to remember when the descriptor 'Doubting' always came before his name.... as if one could do anything but doubt in the face of such incredible news as was shared with him by the others. These days, it seems, the emphasis is more on his confession of faith which comes right after Jesus' appearance among the disciples in that locked upper room: "My Lord and My God!" is Thomas' exclamation as soon as he realizes that he is actually standing in the presence of the Crucified and Risen One. We do sometimes recognize one another by our scars. Thomas thought he needed to see and touch his scars to be certain it was Jesus. In his quest for the truth, he was not afraid to ask the hard questions which led him to an ever deeper faith. But, in the end, as the story is passed on, he didn't need what he asked for. When Jesus simply stood right before him Thomas was able to embrace the truth of who Jesus is with all of his being. The scars told part of the story, but only part of it, it seems. I wonder though. Would Thomas have gotten to that point if he hadn't asked the questions, if he hadn't 'doubted' first? What do you think? Can you think of 'scars' that tell something about who one is and what matters most? What words would you put to the meaning of Jesus' scars? What evidence of Jesus' resurrection do you still yearn to see? What role has 'doubt' played in your journey of faith? What questions about your faith do you still need to pursue that you haven't yet? Where might those questions lead you if you just let yourself ask them? What brought you to that place in those times? Janet has served as a Lutheran pastor in a variety of contexts in Northern Illinois. Currently she serves as pastor at First Lutheran, DeKalb, IL. She learned the art of story-telling at the dinner table growing up and continues to take joy in discovering connections between the Holy and the ordinary world. John 11:16 – Thomas, who was called the Twin, said to his fellow disciples, "Let us also go, that we may die with him." I didn't get to see. I will not believe till I've seen with my eyes. I will not agree till I've touched his side. All you've seen is an unknown stranger. "Thomas these things you say aren't true. When we encounter the resurrection accounts in the New Testament we face a challenge in putting all the pieces together in a way that the sequence of the events flow in logical order. This is due to the fact that no one Gospel presents all, or even most of the data. Some of the data also seems to conflict. Another problem with putting all the facts together in a coherent and reasonably complete manner is that the time line of the events is often unclear in some of the accounts. Luke and John are the clearest as to the time frame of the events they describe but Matthew and Luke give us very few parameters. Both Acts and Paul also supply data wherein the time frame is not always clear. Nevertheless I want to propose to you a possible, dare I claim, even likely, sequence of the Resurrection events. The work is my own and I make no claim that this scenario is certain or backed up by recognized ancient authority. St Augustine has done quite a lot of work in this matter. My attempts here are simply the fruit of 20+ years of praying over and pondering the events of those forty days between the Lord's resurrection and ascension. My reflections are based as solidly as possible on the actual biblical data with a sprinkling of speculation. I realize that the attempt to do this will irritate some modern biblical scholars who, for reasons unclear to me, seem to insist it is wrong to attempt any synthesis of the texts. Nevertheless, I boldly press on figuring that the average believer will benefit from it and find such a synthesis interesting. Take it for what it is, the work of an obscure pastor who has prayed and carefully sought to follow the sequence of the forty days. D. The women who remain encounter an angel who declared to them that Jesus had risen and that they should tell this to the brethren (Mk 16:5 Lk 24:4; Mt 28:5). G. Meanwhile Peter and John have gone out to the tomb to investigate Mary's claim. Mary Magdalene followed them back out to the tomb arriving before they left. Peter and John discover the tomb empty though they encounter no angel. John believes in the resurrection. Peter's conclusion is not recorded. H. The other women have reported what the angels say to the Apostles. Peter and John have not yet returned and these remaining apostles are dismissive of the women's story at first (Lk 24:9-11). B. The two disciples returned that evening to Jerusalem and went to the Eleven. At first the eleven disbelieved them just as they had the women (Mk 16:13). Nevertheless they continue to relate what they had experienced. At some point Peter drew apart from the others (perhaps for a walk?) And the Lord appeared to Peter (APPEARANCE 4) (Lk 24:34; 1 Cor 15:5) who informed the other ten who then believed. Thus the disciples from Emmaus (still lingering with the apostles) were now told (perhaps by way of apology) that it was in indeed true that Jesus had risen (Lk 24:34). C. Almost at the same moment Jesus appears to the small gathering of apostles and the two disciples from Emmaus. (APPEARANCE 5) Thomas was absent (although the Lucan text describes the appearance as to "the eleven" this is probably just a euphemism for "the apostles" as a group) They are startled but Jesus reassures them and opens the scriptures to them (Lk 24:36ff). D. There is some debate as to whether he appeared to them a second time that night. The Johannine account has significantly different data about the appearance on the first Sunday evening from the Lucan account. Is it merely different data about the same account or is it a wholly separate appearance? It is not possible to say. Nevertheless since the data is so different we can call it (APPEARANCE 6) (Jn 20:19ff) though it is likely synonymous with appearance 5. A. There is no biblical data that Jesus appeared to them during the week that followed. The next account of the resurrection says, "Eight days later" namely the following Sunday. A. The apostles received some instructions to return to Galilee (Mt 28:10; Mk 16:7) where they would see Jesus. Thus they spent some of the week journeying 60 miles to the north. This would have taken some time. We can imagine them making the trek north during the intervening days. A. The time frame of the next appearance is somewhat vague. John merely says "After this." Likely it is a matter of days or a week at best. The scene is at the Sea of Galilee. Not all the Twelve are present. They have gone fishing, and Jesus summons them from the lakeside. They come to shore and see him (APPEARANCE 8 ) . Peter has a poignant discussion with Jesus in this appearance and is commissioned to tend the flock of Christ (Jn 21). B. The Appearance to the 500. Of all the appearances you might think that this one would have been recorded in some detail since it was the most widely experienced appearance. Many accounts, it seems, would have existed and at least one would have made its way into the scriptures. Yet there is no account of it, other than it did in fact happen. Paul records the fact of this appearance: 1 Cor 15:6 Then he appeared to more than five hundred brethren at one time, most of whom are still alive, though some have fallen asleep. (APPEARANCE 9) Where did this take place. What was it like. What was the reaction? We simply do not know. Proof once again that the Bible is not a history book in the conventional sense. Rather it is a highly selective telling of what took place, not a complete account. The Bible makes no pretenses to be something it is not. It is quite clear that it is a selective book: (Jn 20:30). C. The Appearance to James. Here again we do not have a description of this appearance only a remark by Paul that it did in fact happen: 1 Cor 15:7 Then he appeared to James. (APPEARANCE 10) The time frame is not clear. Only that it happened after the appearance to the five hundred and before the final appearance to the apostles. A. Jesus certainly had other on-going appearances with the disciples. Luke attests to this in Acts when he writes: Acts 1:3 To them he presented himself alive after his passion by many proofs, appearing to them during forty days, and speaking of the kingdom of God. B. During this time there is perhaps the one appearance we can attribute to this time period as recorded by Matthew (Mt 28:16ff) and Mark (Mk 16:14ff). It takes place on a "a mountaintop in Galilee." Mark adds that they were reclining at table. For these notes this appearance (time frame uncertain) is referred to as (APPEARANCE 11) It is here that he give the great commission. Although Mark's text may seem to imply that Jesus was taken up from this mountain, such a conclusion is rash since Mark only indicates that Jesus ascended only "after he had spoken to them" (Mk 16:19). A. After forty days of appearances and instructions we have a final account of the last appearance (APPEARANCE 12) wherein he led them out to a place near Bethany, gave them final instructions to wait in Jerusalem until the Holy Spirit was sent. And then he was taken up to heaven in their very sight. (Lk 24:50-53; Acts 1:1-11). Jesus' resurrection proves to the world that He is truly the one and only Lord and Savior. No other religious leader in history has accomplished this miracle. Jesus is the only one who can forgive our sins and give us peace in our lives. He is the only one who has conquered death and who can guarantee us eternal life. He is the only one who is the Son of God. The resurrection of Jesus Christ also tells us that He is our victory. He can remove any stone in our lives. He can comfort our deepest sorrows. He can conquer any sin or addiction in our lives. He can help us overcome any doubt or fear we face. "For everyone born of God overcomes the world. This is the victory that has overcome the world, even our faith. Who is it that overcomes the world? Only he who believes that Jesus is the Son of God" (1 John 5:4-5). Are you trapped in a tomb of despair and pain today? Have your dreams been shattered - your hopes crushed? Then seek the peace that only God can provide. God's power raised Jesus from the dead and removed the stone from the tomb. And He can remove the stones in your life - no matter how big they may seem. God, I pray that You would remove the stones in my life. Thank You that no stone is too big for You. Amen. "But when they looked up, they saw that the stone, which was very large, had been rolled away" (Mark 16:4). In addition to the problems normally associated with alcohol abuse, the students' heavier drinking also exacerbates their PTSD symptoms, the study found. "The study doesn't identify what traumas led to the students' stress disorder, but it's safe to assume a good portion of them are survivors of child abuse and/or neglect," says Rayne E. Golay, psychotherapist, child advocate and award-winning author of The Wooden Chair, a novel that illustrates the post-traumatic stress in the wake of child abuse and neglect. Parental alcoholism is often a factor in child abuse and neglect. It's compounded by the risk that as adults, these children model their behavior on their parent - including drinking alcoholically. Golay, who specializes in addictions counseling, says that in her many years in practice, she saw one common misconception among her alcoholic patients: They all believed that their drinking didn't affect anybody but themselves. "That's simply not true. In a home with an alcoholic parent, everyone suffers, the most vulnerable being the children," Golay says. "They live in an insecure and unstable home, and because the alcoholic parent's behavior is unpredictable and terrifying, the children learn to be constantly on guard." Not everyone who drinks alcohol is an alcoholic, Golay is quick to note. And she's not anti-alcohol. However, she urges parents and young adults to seriously evaluate whether alcohol is a problem in their lives, because there are solutions. • Ask yourself the following questions; if you answer "yes" to one, alcohol may be a problem in your life. "One drink -- that is, 12 ounces of beer, 5 ounces of wine or 1.5 ounces of hard liquor -- one drink, no more, no less," Golay says. "If you can do that, you're probably not an alcoholic." She suggests this test because most alcoholics can remain completely abstinent for a length of time, but they're unable to stop after one drink. To an alcoholic, one drink is too much and a million isn't enough. • If you think alcohol is a problem, a 28-day Minnesota Model treatment program gives good results. Golay mentions Faith Based Treatment, and Substance Abuse and Mental Health Services Administration among other options. The residential Minnesota Model combines detox and counseling built around the principles of Alcoholics Anonymous. Individualized, it includes the patient's family. the patient to take a serious look at the consequences of alcohol in his or her life." "When the protagonist, Leini, in my book 'The Wooden Chair', is a young woman, she realizes that she's relying more and more on alcohol to cope with daily life," Golay says. "Leini also recognizes that the abuse she suffered as a child and her parent's drinking are family patterns passed down to her from her maternal grandmother through her own mother. In my book The Wooden Chair, Leini determines to end this cycle by getting professional help." Rayne E. Golay, (http://www.raynegolay.com/), is a certified drug and alcohol counselor whose work with addicts informs her understanding and insights into the consequences of child abuse. She has a Master's degree in Psychology and is a lifelong reader and writer. The Wooden Chair, published in 2013 by Untreed Reads, won the Royal Palm Literary Award for mainstream literature in the 2005 Florida Writers Association's competition. She hopes that this story inspires witnesses to speak up for children whom they suspect are suffering from any form of abuse and/or neglect. Now that the warm weather is on the way, try this wonderful Middle Eastern inspired Indian recipe that also can be adapted for grilling. Stir-fry the gram flour till a pleasing smell emanates. Add chicken cubes and saute on low heat for 3-5 minutes till half cooked. Remove and spread on a clean table top to cool. Skewer the cubes 2 inches apart and roast in a tandoor till done. Bring the cubes close together and coat with egg yolk. Roast till the egg coating turns golden brown. Remove, garnish with onion rings and serve hot with mint chutney. One of the things I remember about being at my grandpa's house was a magnifying glass that he kept on the table beside his chair. It was a heavy duty lens and I loved positioning it over different items and looking at them in larger-than-life form. When you look at something under magnification it looks bigger than it really is. The magnified image is no longer congruent to real life because you're seeing one thing larger than the other things around it. Magnifying something gives a warped sense of how something really is. These results happen when we look at an object under the magnifying glass. They also happen when we look at relationships under a magnified lens. Without realizing it, we move from believing the best about our spouse, our child, our relative, or our friend to believing the worst about them. With their faults maximized and their strengths minimized, we slowly close off our heart to them. Before we know it, a relational wall has been erected by our skewed perspective and unrealistic expectations (that they won't make mistakes, that they should have made a different decision, etc). That relational wall begins a process of separation in our heart and mind. It divides our loyalties and moves us away from the relationship rather than towards the relationship that means so much to us. It's not the big things that kill relationships. It's often the little things that accumulate over time. Looking at faults through a magnifying glass is a little thing that can do damage over the long haul unless we do something about it. 1) Move the magnifying glass. Move your focus from what they do wrong to what they do right. If you're finding yourself critical of or angry or disgusted with your spouse, you've likely had tunnel vision on their imperfections. Sit down and make a list of their strengths and what they contribute positively to the relationship. 2) Stay focused on what you love. What you focus on will expand. If you focus on what bothers you, all you will see are the things that tick you off. Keep your eyes on what you love so you fill your heart with love. The enemy is cunning and will do his best to get your emotions tangled up and engaged. Once your emotions are engaged it becomes easier to see your spouse, your challenging child, your sister-in-law, or your friend as an enemy. This is the first step of dividing and destroying. Don't take the bait! 4) Believe the best about your loved one. Resist the urge to make their mistake a personal offense towards you. Beware of statements you might make to yourself like, “If he really loved me he wouldn't have done that,” or “She did that just to tick me off.” These kinds of statements are fertilizer to negative emotions. Are you making a mountain out of a molehill? In the big scheme of things, is this really a big deal? When you measure this imperfection, mistake, or disappointment against all the good things about the person, you'll quickly see that this situation isn't worth the energy you're giving it. You need spiritual perspective as well. Remind yourself who the real enemy is (Satan) and what his agenda is (to divide and destroy). Don't let yourself get sucked into his distraction and deception. 6) Learn to move forward. Sometimes we need to give grace, forgive, and let it go. Sometimes we need to have a conversation with the person, but only after our emotions have calmed down. And sometimes we need to realize that our own pride or insecurity is the bigger issue here and its helpful to move the magnifying glass from our loved one to ourselves for a few convicting minutes. Don't let it sit there for too long or you'll move from conviction to condemnation in no time. That old magnifying glass of my grandpa's had its place in this world. It helped him see things more clearly at times. Magnifying glasses in relationships can do the same. It all depends on what you're looking at. What about you? Where have you had your relational magnifying glass pointed at the wrong things? What are you making bigger than it needs to be? Jill Savage is the founder and CEO of Hearts at Home, an organization for moms. Jill is a sought after speaker and the author of 8 books including Real Moms…Real Jesus and My Heart's at Home. Jill and her husband Mark are the parents of five children, four biological and one adopted. The Savage's make their home in Normal, Illinois. This article originally appeared at Hearts at Home. Used with permission. BEIRUT (AP) - Syria's president marked Easter with a tour Sunday of an ancient Christian village recently recaptured by his forces, state media said, as the country's Greek Orthodox Patriarch vowed that country's Christians "will not submit and yield" to extremists. Syrian state TV and the country's official SANA news agency said President Bashar Assad visited the hilltop hamlet of Maaloula, inspecting the damage done in recent fighting to its monasteries and churches. Rebels, including fighters from the al-Qaida-affiliated Nusra Front, seized Maaloula several times late last year, most recently in December. Government troops swept through the village on Monday, sending rebel fighters fleeing to nearby hills. Maaloula is located some 40 miles (60 kilometers) northeast of Damascus and is home to a large Christian population. The army's triumph in the village was an important symbolic prize for the government in its quest to be seen as protector of religious minorities, including Syria's Christians, who have largely supported the Assad family's decades of rule. During his visit to the village Sunday, Assad promised to defend Christians - who make up about 10 percent of Syria's prewar population of 23 million - and protect churches that he said were part of the country's cultural heritage. "Nobody, regardless of the extent of their terror, can erase our cultural and human history," the state news agency quoted Assad as saying as he surveyed damage to the Mar Takla Greek Orthodox monastery. Despite damage to holy sites in the village, Assad told state TV that "Maloula will remain steadfast in the face of barbarism of all those who are targeting the homeland." Assad's forces and rebels trying to overthrow him are locked in a civil war in which more than 150,000 people have been killed. Millions more have been driven from their homes during the 3-year-old conflict. In comments to mark Easter, Patriarch John Yazigi called on the warring sides to end the practice of "intimidation, displacement, extremism and takfiri mentality," a term for Islamic extremists. Such radicals have become increasingly influential among rebels, attacking Christians- who they see as infidels - partly as punishment for their support of Assad. Yazigi called for dialogue and reconciliation, hailing Syria as a home for Muslims and Christians alike. But he said there would be no reckoning with Islamic extremists, vowing that "we will not submit and yield to those who transgress against our people and holy places."